I was sooooo happy to be apart of her day today! I did her hair and makeup and also helped to take pictures at the ceremony for her. She had an "anything goes" theme to her wedding, which leaned more towards a gothic theme. She made her own dress, bouquet and hat to go with it. Her family members and her new family also dressed up to celebrate this occasion! 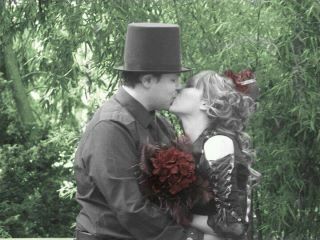 It was a nice ceremony with intimate friends and family in a park nearby that has a beauitful Japanese inspired Garden. Minutes before we all arrived at the park, there had in fact been another wedding ceremony taking place! So, there are many more couples tying the knot on Halloween! Here are just a few pics I managed to take in between of taking video and pictures for her and her husband, James! It was so heartwarming to see Michelle and James exchange vows, the energy in the air was so loving and I even teared up when they said their "I do's". I am so happy for them to start their lives together as husband and wife and I congratulate them on their wedding!